If you're building a house or if you're in need of a new roof on your existing structure, you may be asking yourself what types of roofing materials are best for your project. We at Construction Unlimited, LLC are at your service to help you with the correct choices for your home. Durability should certainly come into play, but cost may be another concern. The true cost of a roof may be far different from the initial cost and one should also consider how long the roof will last. Clay and concrete tile roofs cost more initially than asphalt, for example, but may last a decade or more longer. The most popular type of roofing material is the asphalt shingle and it is also one of the least expensive. Asphalt shingles come in many colors and are less expensive, but will give you decades of service. When you are building a new home, you may be looking for places to cut costs, but your roof shouldn't be one of them. It is much better to use the highest quality materials that are available to you because it not only protects the actual roof, but it protects your interior from the elements as well. A roof of tiles made of clay or concrete gives your home a distinctive look and they are available in a lot of different colors and, in general, will last longer. A very distinctive look in a roof, (and sometimes used in siding as well), is cedar shingles, also called “shakes.” Shake shingles used to be very popular. The reason they fell out of favor in today's market is that they are a bigger fire hazard. Certainly a home that has a bigger fire hazard will result in higher home insurance premiums as well. Those considerations make looking at alternatives that are more effective, and sometimes cheaper, a good option. Every type of shingle has a different warranty. In most cases, a longer warranty comes with a heavier shingle. This is because the heavier shingle has more waterproofing and holds up better to hail, snow storms, and violent winds. There are a multitude of options open to you, from asphalt to fiberglass all the way to metal, but it is also important to consider the anticipated life expectancy of your new roof as well. If you are considering a metal roof, it is important to find a contractor who specializes in this type of project. Metal roofs, if installed and maintained correctly, can last up to 100 years. No other roofing material can last that long. Metal roofs cost more, but they are a long term investment. Metal roofing requires special tools and different skills, so it is important to look for someone with metal roofing experience. If you are building a new home, or if you are interested in new siding for your existing home, Construction Unlimited, LLC can help you find the most appropriate alternatives. The most frequently used siding option is vinyl siding. It is available in a limitless array of colors. Vinyl siding has been available since the 1950's, and it has gone through a number of innovations and improvements since. 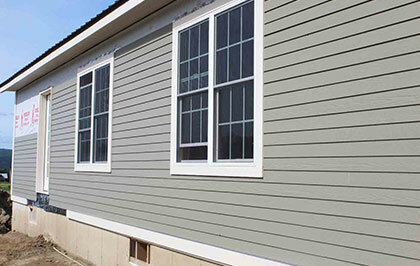 The vinyl siding that we have available is 100% weatherproof and, with minimal maintenance, it will last for decades. The durability of vinyl will save you money in the long run and will keep your home looking new, and will increase its value. Your options for vinyl siding are more varied than ever before. There are many vinyl companies offering a wide variety of decorative detail such as historic wood and fish scale shingles. If you are considering rejuvenating an older home, then new siding is the best place to start. Re-siding with vinyl will give an older home a new look that will enhance your home’s value. If you’re considering putting your house on the market and it needs painting, have new vinyl siding installed instead. It will make your home more attractive and it will never need painting again. It not only adds to the attraction of your home, but it improves sales appeal. When you consider that the exterior of your home is constantly exposed to the harsh elements it is important to give your home maximum protection. Vinyl siding doesn't rot, swell, warp, chip, peel or fade and it protects against insect infestation better than wood or shakes. Water can splash up along the lowest levels of the house, causing wood to swell or warp which vinyl siding will never do. Of all the various siding material, stone would be the most durable for obvious reasons, because the elements such as rain, snow, ice, and heat have little effect on it. Stone or brick is an attractive alternative, although, someone with a different set of skills is needed to install it. The appeal of brick or stone exteriors are a great option because it is the ultimate in durability and comes in a variety of shapes and color options. At Construction Unlimited, LLC, we can provide that service to you. So, if you are building or considering a new roof or siding, we at Construction Unlimited, LLC have the answers and the materials to help you arrive at the right decision and to make it happen!